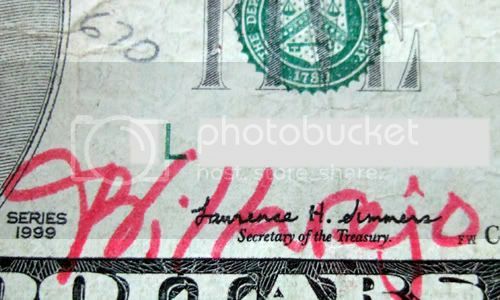 I’ve got three new bills to post pictures of, all of which involve text. The first one is fairly obvious. It just reads, "Alex" in big blue letters. Not much of a mystery there. The question is as to whether it’s a person who wants to get their name out there (or if they’re expecting to get their bills back or something) or if there’s some bigger meaning to it. Some things, like the bank marking in my previous post, I can figure out. This is some sort of standard procedure, or at least the byproduct of it. With a person’s name, it’s not as clear. There are so many people named Alex out there that the real mystery is why they do it. This one, I’m still trying to figure out. Does it say Billarejo? Google has some hits on it, but Alta Vista can’t translate it. I’m guessing that it’s a name. It does look like a signature. That’s really the only thing I can think of. Maybe this Billarejo person knows Alex. Maybe the two of them should get together. I have to wonder if the people that put their names on bills know each other. At least that one was somewhat legible. This one is blue letters enclosed by a black line. It could be zoclath or zoclatli or something like that. It’s hard to tell. The first letter might even be the number 3, like 30 clatli. This is one of those things that I’d appreciate some comments on. I’ve actually made the top fifty on Where’s George in the state based on George Score. (For those wondering, it’s derived from a formula based on hits, bills entered and the number of days since your last activity.) Sitewide, I’m hovering around 1,000th place. If I see any new bills or move up in place a lot, I’ll let you know.